Join Jackie as she shares her thoughts on a new adventure set before the start of Ranger’s Apprentice series. Does it add to the overall experience? Spotting a new John Flanagan novel in the bookshop is always a positive and it was an easy decision to purchase the second prequel to the Ranger’s Apprentice Series, The Battle of Hackham Heath. Regular readers of the series should enjoy the glimpses the book gives of the earlier lives of favourite characters. If Gillan’s apprenticeship to Halt didn’t happen exactly the way an earlier novel described it, the version in this tale resonates satisfactorily with our knowledge of both characters. There is also the story of Cassandra’s mother, which fills in a gap in the story, and adds to our understanding of the close relationship between Cassandra and her father King Duncan. The usual ingredients of adventure, acts of bravery and the battle against the series’ arch villain Morgarath are all present together with a battlefield struggle against seemingly insurmountable odds – just what readers of John Flanagan have come to expect! The battle sequence should particularly appeal to teenage boys. I found that this novel met the true test of a prequel – it closed by bringing the reader so perfectly back to the start of the original series that I was forced back to my bookcase to re-read the first four novels of the series again. 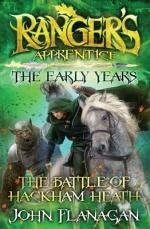 I imagine that this will be the last Ranger’s Apprentice book to be published – after two prequels, The Lost Stories and a next generation novel in The Royal Ranger, the story seems to have been completed. But hopefully there will be many more novels still to come in the spin off Brotherband series, where there is always the chance of meeting one of your favourite Ranger’s Apprentice characters. Editor’s note: Having caught up with the fascinating The Lost Stories over Summer, now I have another to add to my wish list. John Flanagan has an informative and engaging website, The World of John Flanagan, that is worth a visit to find out more about the Ranger’s Apprentice and Brotherband series – visit and be entertained.